This spring I worked on producing a Swinerton Builders Then and Now multimedia marketing video. The video is about Swinerton Builders celebrating their 125th anniversary in 2013. Multimedia and video is an effective way to tell the Swinerton Builders story of their fascinating history. Fascinating it is. This is what I love about the creative business. Every new project is a license to learn. More often I’m learning about new technologies. This multimedia video was refreshingly very different to learn about architecture, design, and history of a great San Francisco building company. 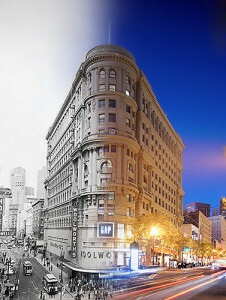 Doing the research for this corporate video going back to 1888 was fascinating, as I watched and edited twelve decades of historical footage, archival images, and learned how Swinerton Builders has transformed the San Francisco architectural landscape with landmark structures. Swinerton has built some very high profile buildings; the San Francisco Public Library, SF MOMA, De Young Museum, and the Hotel del Coronado in San Diego to name but a few. Visit Swinerton.com to learn more about their organization, or pop over to the Swinerton YouTube channel. Developers, architects, and builders still fascinate me how they alter our social sphere through the impact of their creations. While I was only mildly altered, from several weeks of producing this video marketing piece in After Effects, I think this 125 years in eight minutes gives viewers a good sense of Swinerton Builders then and now.